Objective: To update the scientific evidence relating to the efficacy of clear aligner treatment (CAT) in controlling orthodontic tooth movement (OTM). Materials and methods: International medical databases were searched to identify all peer-reviewed papers potentially relevant to the review. The quality of evidence was ranked using the Swedish Council on Technology Assessment in Health Care Tool criteria. Results: Twenty relevant articles were selected and the quality of evidence was high for three studies, moderate for 12 studies and low for five studies. Mesio-distal tooth movement revealed the highest predictability, with a molar distalization up to 2.5 mm and space closure of 7 mm performed with good control. Arch expansion is predictable up to 2 mm on molars. Improvements in Little's and PAR Index were reported in mild to severe malocclusions. Conclusion: The overall quality of available evidence was of moderate/high level. CAT aligns and levels the arches even in severe cases, with efficient control of incisors inclination. Arch expansion and tooth bodily movement are efficiently achievable movements with CAT. SmartTrack, created by Align Technologies, has a lower initial insertion force and a longer working range compared with the older EX30 material to aid orthodontic tooth movement (OTM). Objectives: To investigate the effect of SmartTrack on OTM in vivo over a 25-day period, compared with the EX30 material. 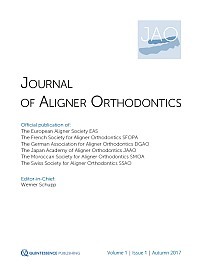 Methods: Aligners made of one of the two materials and programmed for 0.25 mm of buccal movement of a maxillary incisor were used in 33 subjects (17 females and 16 males), between 18 and 40 years old, for 22 h per day for 25 days, in a randomised, blinded manner. Results: SmartTrack achieved a significantly higher mean OTM (73.1% of planned tooth movement), compared with EX30 (42.8% of planned tooth movement) by day 14. No difference in OTM occurred from day 14 to 25. Conclusion: SmartTrack achieved a higher mean OTM compared with the EX30 material over a 25-day period. Objective: To determine the optimal method to correct rotations of conical teeth using thermoplastic appliances with and without attachments. Introduction: Despite the increasing popularity of clear aligner therapy, there are still questions as to its effectiveness, efficiency, case selection and limitations. It has been reported that the full prescription for clear aligners is not expressed, and that the mean accuracy of any type of tooth movement using clear aligners is only 41% (Drake, 201213). One of the major limitations of clear aligner therapy is the correction of rotated conical teeth, especially canines and premolars (Kravitz, 200814). According to Simon et al (2014)12, mandibular premolar derotation has the lowest predictability of movement and accuracy with clear aligners. This is due to the fact that conical teeth lack interproximal undercuts, and as a result, the aligner tends to slip as derotation is attempted (Kravitz, 2008; Simon, 2014). To address this limitation, the use of resin bonded attachments, interproximal reduction, overcorrection, auxiliaries, or adjusting aligners with thermopliers has been recommended - however the effectiveness of these methods has not been well established. Materials and methods: The design of this in vitro study was prospective and experimental. A comparative study was performed to examine the effect of attachment location and the number of attachments on rotational control of conical teeth relative to control, which was rotational control with no attachments. Total rotation correction was recorded as an angular measurement after placement of each aligner, as measured on a digital scan (Ortho Insight 3D) using Geomagic Design software. Results: Results of a one-way ANOVA showed that there were no statistically significant differences between the six groups. The group with a rectangular attachment on the buccal surface had the highest overall rotational correction. Conclusion: Attachments appear to mildly improve rotational correction of the mandibular right second premolar. Increasing the number of attachments does not appear to aid rotational control, as the group with a single buccal attachment had the highest overall rotational correction. Multiple attachments, and adding attachments to adjacent teeth, appear to impede rotational correction in this study. In skeletal Class III patients, severe disharmony of the maxilla and mandible is corrected surgically. However, there is a wide variety of criteria for this surgery and practitioners must often select a non-surgical treatment if requested by the patient. In such a situation, in patients where anterior crowding is accompanied by anterior crossbite, a common treatment involves improvement through mandibular pre-molar extraction and lingual inclination of the mandibular incisors1. In addition, expansion of the maxillary dental arch is an effective technique. However, from an aesthetic point of view, patients occasionally choose a multi-bracket appliance, even on the lingual side, in favour of a removable device. Just a few years ago, when compared with multi- bracket treatments, aligners usually required longer treatment times and the lack of precise control of axial movement led some to suggest that cases treated with aligners must be chosen carefully2. Since 2010, when Schupp et al presented a successful treatment of class II relationship using the Invisalign system with non-extraction, but molar distalization3, more and more practices have begun to treat patients previously believed to need extraction with a non-extraction distalization approach4- 6. Compared with case reports on the distalization of maxillary molars, the number of mandibular-molar distalization case reports is lower7, and clear data (molar distalization distance limits) have not yet been presented. This article reports two patient examples. In the first, we used the Invisalign technique only, changing the aligners every 7 days. The second patient example shows a non-surgical treatment of a severe skeletal Class III using a combination of aligners with temporary anchorage advices (TADs)8 and AcceleDent9-11 (OrthoAccel Technologies, Inc, 6575 West Loop South, USA)] obtaining more effective and faster mandibular molar distalization. Pulling down an impacted tooth is always a challenge for the orthodontist. It must represent his highest priority before starting any other treatment phase. This article attempts to highlight the importance of early prevention and diagnosis when we encounter this condition. It also discusses the interest in using aligners in such cases, provided that the practitioner follows certain guidelines and starts with the specific staging of the ClinCheck. In this case report, a palatally impacted canine has been avoided, along with a slight Class II malocclusion treatment, using aligners from the Invisalign system.